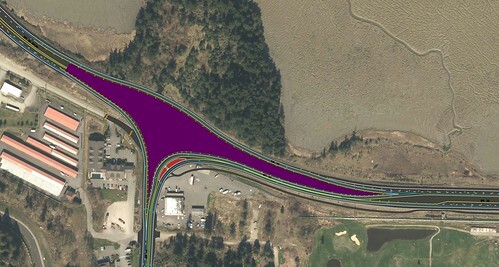 During the first phase of construction starting on Monday, April 2, WSDOT contractor crews will close a lane of SR 20 at Miller/Gibralter roads and alternate traffic through the area around-the-clock. Traffic will always have access on and off of Gibralter Road during this phase of work. 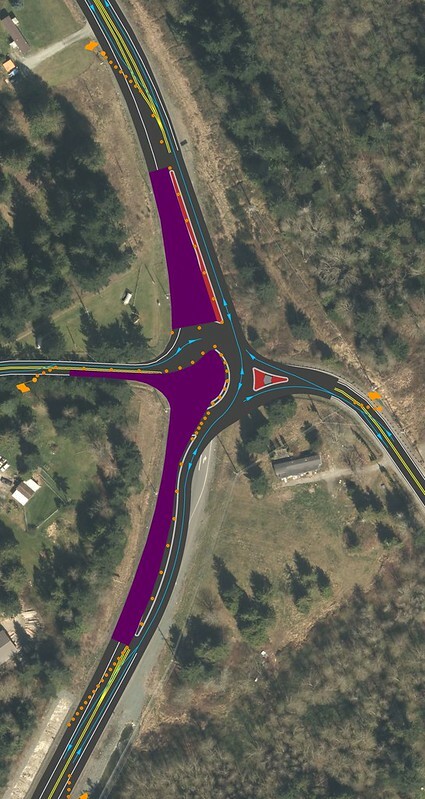 During the second phase of construction, contractor crews will switch traffic control and build the other side of the roundabout at SR 20 and Miller/Gibralter roads. Flaggers will continue to alter traffic through the area around-the-clock. Building this roundabout is expected to take about a month. This is what travelers should expect final construction to look like at SR 20 and Miller/Gibralter roads. 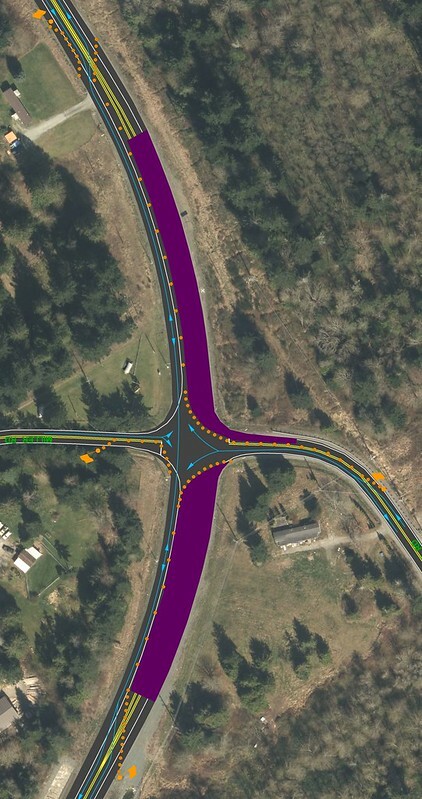 When major work on the Miller/Gibralter roundabout is complete, crews will move north to begin work on the SR 20/SR 20 Spur (Sharpes Corner) bypass lanes. Traffic will be reduced to a single lane in all directions 24/7 during this work. 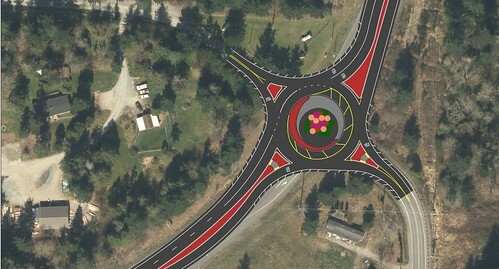 Following Memorial Day Weekend, crews will begin to build the Sharpes Corner roundabout. During this work, access through the area will remain a single lane in all directions around-the-clock. 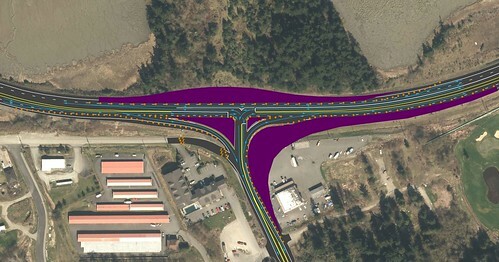 Traffic from Anacortes to Burlington will need to use the new Miller/Gibralter roundabout to get to Burlington while traffic from Oak Harbor to Anacortes will need to drive east to March's Point Road and U-turn back toward Anacortes. Please be aware of signs, barrels and directions that will be constantly changing during this work but will help you safely get through this work zone. 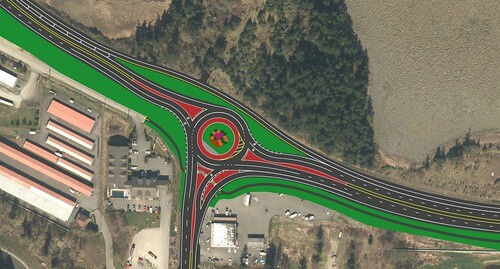 The final Sharpes Corner roundabout includes two lanes, a bypass lane on two of the legs and a truck apron (red sections of drawing) to accomodate the large vehicles that use this stretch. A pedestrian and cycling trail will also be installed south of the intersection to help connect travelers to the Tommy Thompson Trail.